This morning all Platinum and Premium members received an email that included a recap of the performance of your articles as listed on EzineArticles.com. Top 3 Performing Articles along with top 5 key phrases used to find them by your readership. It’s our hope you will use this data to become aware of which keywords and keyphrases people are using to find your existing articles… and with that insider data, you’ll write & submit new articles this month based on that information. BTW, this information is always available to you via the Traffic Search Terms feature; but this email saves you the trip to dig for the data. The secondary purpose is to show you how much traffic & visibility your articles are attracting for you. How would you like to see these email reports improved? What additional information should we include in them? Is monthly the right frequency to send them or would like them more or less frequently? 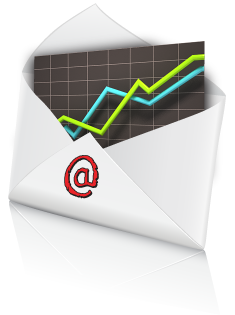 Does this email service lead you to really write and submit more articles or not so much? Would you like to see total # of clicks delivered to your website? Would you rather see this email in HTML instead of plain TEXT? Should we include your Previous month PROFILE views along with TOTAL views life-to-date? Is this useful? Wow, that is the most helpful thing I have ever gotten. I have always had such a difficulty figuring out the key words that my audience would type in. Thank you for helping me build my business. You guys rock. Or roll. Even though I fell head over heels for your April Fools joke, I still appreciate and love you. All of the data you supplied is quite interesting to me. Especially interesting is the number of clicks to my website. the most attention (clicks) and which the least. I will now try to write articles that focus more on increasing the number of clicks to my website, since more traffic there can lead to more sales of my unique products. Thanks for all the information you have provided. I would like to see the top 3 performing articles changed to the top 3 for the month. One of my articles hadn’t been viewed in months but was still a top 3 for all time. Top performers for the month would be more helpful. All in all I think it’s a very good added benefit for publishers! It’s a great service to know how our articles are being received. This can help us to determine which topics are of greatest interest to readers. I find that very helpful. It’s hard to say at this point how frequently we need the reports, but monthly would work for now. Thanks for the helpful stats! Thanks! I constantly check my stats on my own but the key words and phrases were extremely helpful. Will definitely make use of the info. What a nice service! Diana K makes a good point; perhaps you could include the top 3 for all time, and the top 3 for the month, too. Monthly is good, total number of clicks is good, and yes, it would give me direction for future articles as well as useful keyword info. Profile views would be good and the email is fine as it is–plain text. Thanks Guys, already follow on site, this however was a pleasant surprise to find it in Email and with the key words noted! Took a writing/publishing haitus. Just returned. WOW! Am I impressed! yes, yes, and yes … yes to all and yes also to top 3 all time as well as top 3 of the month. This is very helpful, and will increase frequency of publishing. Superb data! Leading edge as ever. Very helpful. Maybe less performing articles are to be mentioned too that may throw light on less popular keywords used. Diana’s top 3 for the month is also a good suggestion. Great Sevice, monthly is good, total number of clicks is good, and yes, it would also give me direction for what trend for future articles with keyword info. WELL DONE! KEEP UP THE GOOD WORK SO WE CAN ALL GET BETTER! Many thanks for this summary. I especially like the keyword summary for each article. I have taken my focus off article writing a bit recently and so getting this in my inbox each month will be a good prompt to keep writing! – Is monthly the right frequency to send them or would like them more or less frequently? I’m pretty certain from the public and private feedback, we’ll be keeping this stats email service as monthly. But, if there is enough demand, we could create a more frequent email frequency (weekly for example). For the June mailing of the May 2009 report, we’ll be including the total clicks delivered in the current month and expanding the top 3 to the top 5. We’re investigating how to deliver the top 3 of the month instead of all time as that may not be what you think it will be… meaning, it’ll most likely be OLD articles that just got a lot of traction in this month…whereas I think some members will expect to see which keywords were used to find their newest articles (when the reality is that it does take 3-6 months before articles really get enough traffic to have statistically valid referral data). The one thing I know for sure: June’s report will be better than May’s report and we’ll tweak again in July until we send you a report that you eagerly look forward to. So, I wrote an article almost immediately considering the info given and plotted out 2 more. ~Smile. This is GREAT! I got my report over the weekend, and I thought wow! It sure takes the guess work out of my “personal score card” and goals. Sometimes article authors set “high goals” for their work, and it’s just great to know when it is all paying off, or where we can improve to make our “mile-markers” and get closer to closer to them. Thanks, all you for your emails. Thanks for the summary and thought provoking questions. I think that this info should be available to every eZine expert author, if yo have to wait until you reach platinum grade a lot of effort can be wasted. You can reach Platinum level membership comfortably within a month or less. Also, these reports are not cheap… in terms of the internal resource costs required to pull off the mailing each month. The reports don’t become very meaningful until a member has at least 20+ articles with us over a period of time; therefore we have no plans to release this feature to Basic level members. I could probably be persuaded to make them available to BASIC PLUS members… Will think on this. Basic Plus would be nice! I find the keywords are extremely helpful and look at ways of building those into my websites and blogs to try and improve direct traffic. If you run Google analytics you can actually check bounce rate in the traffic sources section for Ezine and see if once they get to your website they stay on it and read the content. 100% bounce rate is bad news but if you are achieving around 50% you are doing OK. Sorry forgot to say frequency is about right for me, any more and I probably wouldn’t have time to look into the data anyway. I just submitted an article and am impressed by this fantastic portal. I shall work hard to become “basic plus” and more. I read and heard som testimonials. That’s really the right place to land. (I’m not rocket builder). I tried to find how to promote morphopsychology, now I have the tool at hand ! I am having great diappointments, aggravations, and tons of wasted time and efforts in dealing with some of the hysterical EzineArticles Editors. According to EzineArticle’s rules, an author is entitled to capitalize the first letter of each word in his TITLE or not. I decided to capitalize the first letter of each word UNLESS a scientific term mandates lowercase. I comfront omnipotent Editors deciding IF that rules applies and IF the author has a saying on how his TITLE should read. I was threatened with being shut down and my articles removed if I continue requesting for ALL my articles to have the TITLE as I wrote it which comforms with all rules. I intend to send a letter to EzineArticles by mail. I hope that someone who “is not in one of those days” may be more sensible, civilized, and reasonable. Does anyone know the physical address for EzineArticles so as for me to send a letter to whoever is the head. This disappointed and aggravated EzineArticles Author is very thankful in advance if someone could come forward without fears of retaliation. He really is. No need to send us a physical letter as the CEO (me) just read your complaint. I’m going to ask our Managing Editor to research and respond publicly and/or privately to you today.